Children’s brain tumors aren’t like those in adults. They require dedicated research and specialized treatments. More than 28,000 children in the United States are living with the diagnosis of a brain tumor, and close to 13 more cases are identified each day. 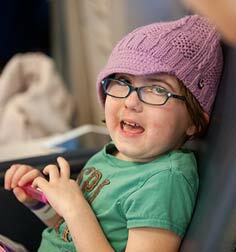 Children and teens with brain tumors are the PBTF's Stars. Check out the Starlights series for their inspiring stories. Achieving a world without childhood brain tumors demands an aggressive strategy. Read our 2017-2019 Strategic Plan to see what steps we're taking today to put an end to pediatric brain tumors tomorrow. We also produce an annual report that contains an overview of our programs and mission investments.